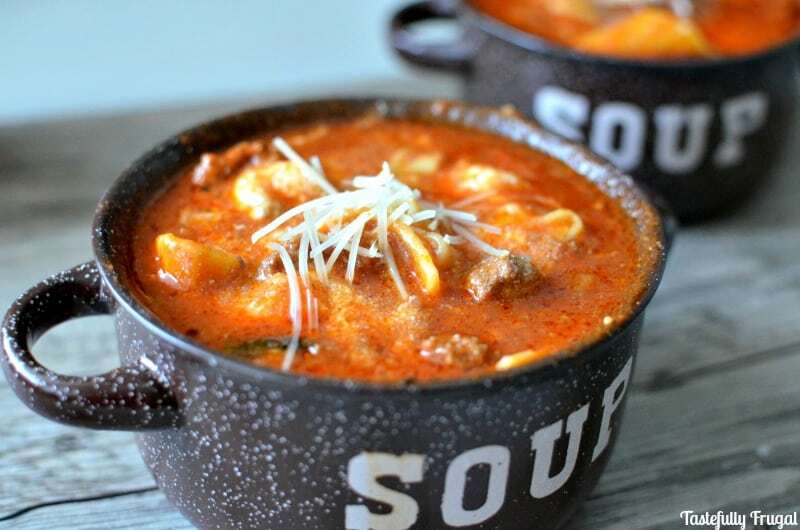 This quick and easy lasagna soup is the perfect week night dinner and will have your family asking for seconds! Are you loving this fall weather?! We’ve had beautiful afternoons where the kids can play outside in t-shirts and cooler nights perfect for sipping on warm cider and cuddling up under a blanket. It’s also perfect for soups! We’ve had a really busy couple months and it’s getting even busier. As much as I would love to have a soup that has been simmered for hours that’s just not an option most nights. That’s where this recipe was born. I know I shouldn’t complain about how busy I am; I only have two boys and they are really well behaved (most of the time). I don’t know how moms with more than two kids (or single moms with no help) do it. My mother in law had six kids and buried her second husband when her youngest was 9. Yet she still managed to wake up every morning and help the kids with their homework and piano lessons and have dinner on the table every night. Her go to meal was lasagna and it was so good! I love lasagna too but rarely do I have the hour or two to make it and wait for it to cook. 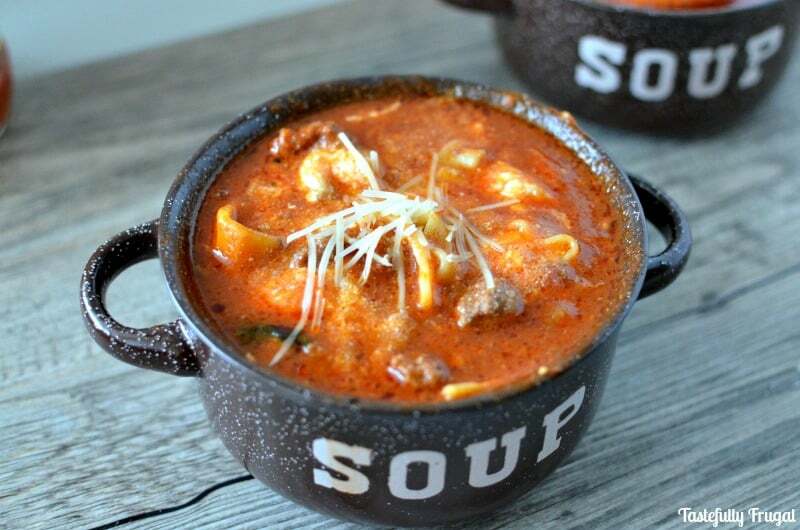 This lasagna soup is a tasty alternative to her oven dish and tastes just like it! The best part, well there are 3 best parts. One, from start to finish it only takes 30 minutes to make. Two, you can make it in one pot, clean up is a breeze! And three, with only 6 ingredients it’s easy on the wallet too. The key to this soup being so easy (and tasty) is Ragu Pasta Sauce. Made with vine-ripened tomatoes, fresh basil, fennel, garlic and ground pepper this sauce has everything you need for the perfect lasagna (or lasagna soup) just add your meat, cheeses and noodles! Assunta Cantisano, Ragu’s founder, brought the recipe over from Italy when she immigrated to the United States during the Great Depression. As a single mother she was determined to provide for her young family and that she did. What started as sharing her sauce with her neighbors and then her neighbor’s neighbors, Assunta took Ragu sauces to stores where they quickly sold out. You can learn more about Assunta’s journey on the Meet The Founders Page on Ragu’s site. My hope is that I can leave a legacy in the kitchen just like my mother in law and Assunta have done. This soup has quickly become one of our family’s favorites and a recipe I’m sure to pass on to my boys. The sweet tomatoes pair perfectly with the garlic and basil and the ricotta cheese is just the ooey-gooey icing on the cake, so to speak. So if you have a busy week ahead pick up a jar of Ragu Pasta Sauce and lasagna noodles at the store and prepare to have your tastebuds amazed! In a large stock pot brown ground beef. Remove grease. Return beef to pot and add Ragu, broth,tomatoes and noodles. Bring to a boil. Reduce heat to simmer, put lid on and let simmer for 25 minutes. After 20 minutes stir in 1/2 cup parmesan cheese. Pour soup into bowls and stir in ricotta cheese. I used Traditional Ragu Sauce but any variety will work. You need to use the ready for oven lasagna noodles if you get regular lasagna noodles they won't cook in time. Do you have a recipe you love that could use Ragu Pasta Sauce? Head on over and enter The Ready. Set. Cook! contest sponsored by Food.com. You could win $3,000 or one of several other prizes! Hurry, contents ends November 30th. I’ve never tried Lasagna Soup before, I’ll have to make it soon. We use Ragu Green Pepper and Mushroom for our regular lasagna. It’s been a family favorite for the past 12 years! 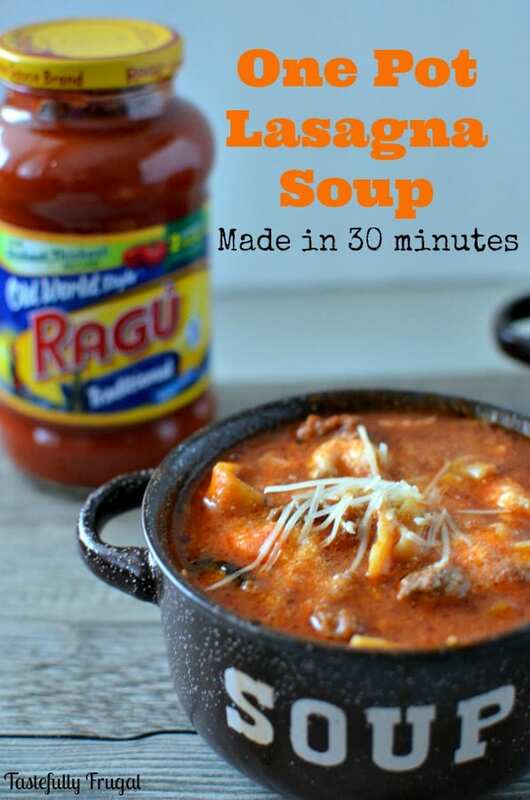 I have never had a lasagna soup before, and since my family loves lasagna, this is going to have to be one we try! Thanks! Ooh, this looks so good! I love that it’s simple. I need more simple recipes for weeknights! This looks so delish! I love lasagana, the recipe looks very easy to make and I eat a ton of soup, I have saved the link and emailed it to myself. This looks fabulous! And it will be easy to convert to gluten-free, too!